Last winter I made the decision to get in touch with nudibranchs. I decided one of the easiest for me to find might be the little red one known as Rostanga pulchra. They feed on a common encrusting red sponge, so all I needed to do was find the prey, and the predator shouldn’t be far away. The photo below isn’t my best, but it captures the moment when I first applied myself to the red sponge, Ophlitaspongia pennata, or a close relative anyway – what the field guides usually refer to as velvety red sponges. I’m not sure this is even it, but I am fond of the photo anyway because at the time I took it, I was so focused on the red sponge, its awkward angle on the cave wall, the swell, and my camera’s unruly behavior in the dim light, that I didn’t even notice the purple encrusting sponge, Haliclona permollis, or the little starfish just a couple inches away. Is that Leptasterias? 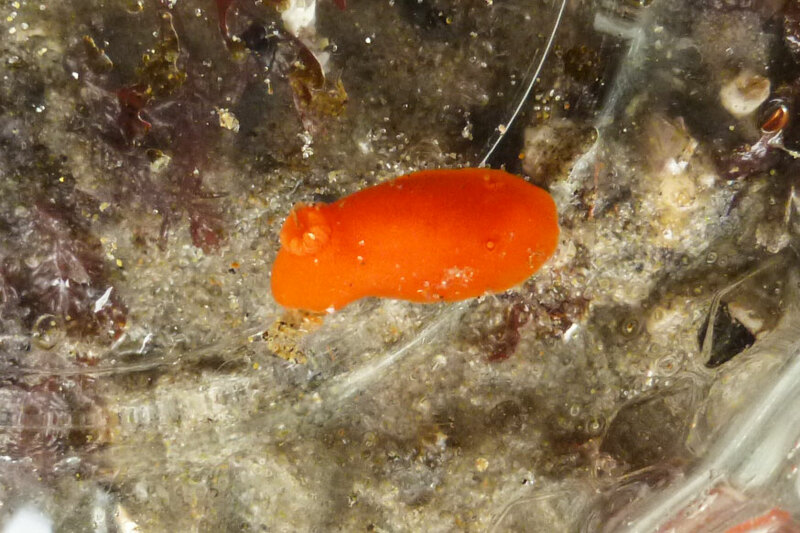 It was a couple weeks later when I got back to the shore on a low tide and laid eyes on my first nudibranch; not R. pulchra, but Doris montereyensis. May 16, 2014 at 6:56 am. 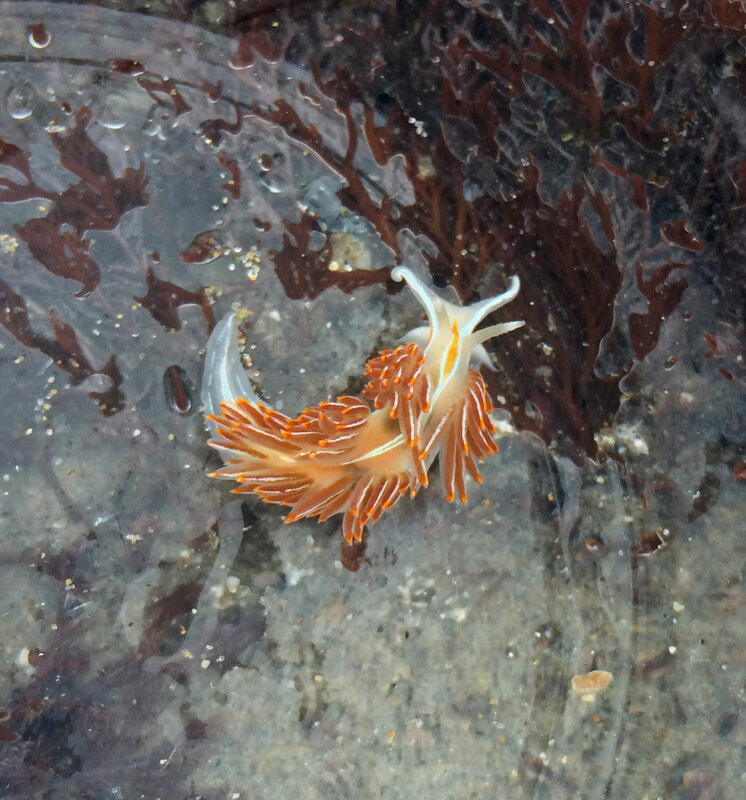 If you haven’t thought much about nudibranchs, they are happiest, more active anyway, when covered by the tide. This one is exposed and more or less quiescent. The head is pointing down and the two bumps on that end are sensory. A tuft of gills marks the rear end. There it is, my first nudibranch – hanging out on a rock wall with some young goose barnacles Pollicipes polymerus, lots of little brown barnacles, Chthamalus dalli, and a big starfish, Pisaster ochraceus. Looks like some little Leptasterias too. And up top, though I wouldn’t put money on it, maybe a mat of green sponge. 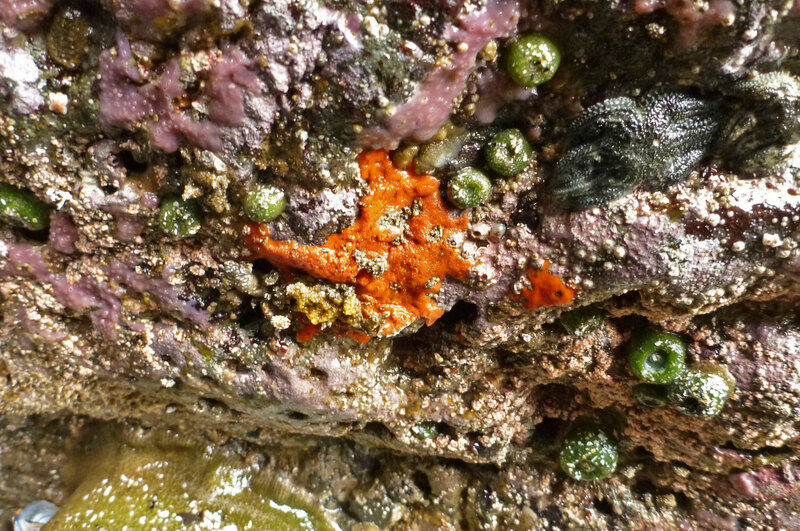 A month later this low tide pool yielded D. montereyensis, R. pulchra, and Hermissenda crassicornis. First I saw little red R. pulchra exposed just above the water line and soon after that, without changing position, I noticed H. crassicornis under the water line at about elbow depth. That deep in the rippling pool, it was more of an impression or possibility than a confirmed H. crassicornis. Watching, but not feeling, blurry orange gills fluttering against my fingertips, a discomforting feeling dawned. My fingers might be too blunt and uncoordinated for the task I was putting them to. I wasn’t going to harm that little slug if I could help it, but I’d waited years to see this one in the wild and I wasn’t going to leave the pool without seeing it, if it was one, up close. It’s an age-old naturalist’s dilemma; I’ve experienced it in various forms, many times. 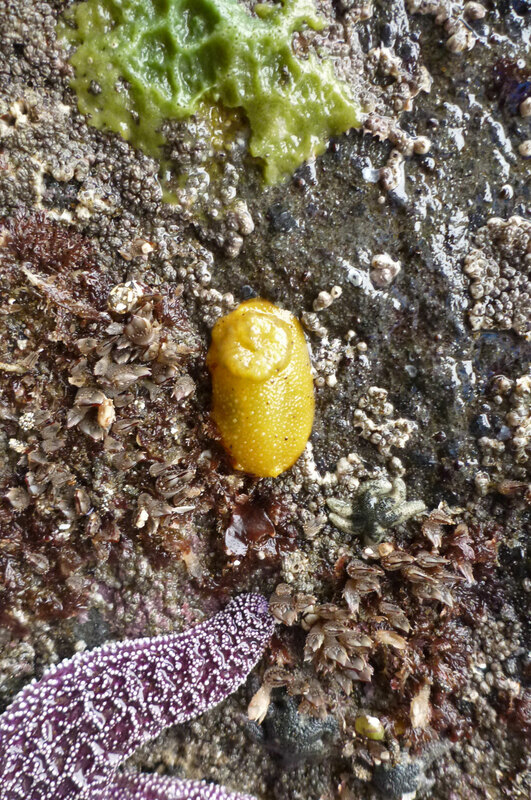 With perhaps more care and deliberation than I have ever mustered, I lifted that inch and a half-long sea slug off off its rock. Shy Rostanga pulchra just couldn’t relax. During a drawn-out repatriation, a nearly imperceptible swell on the rising tide nearly overtopped my waders. It was time to get going, and I did, but hit a little snag. The surf and rising waters had blocked my earlier path, bringing on another common naturalist’s dilemma. Negotiate the surf, or traverse a boulder-strewn headland? Three minutes later, choice made. I don’t write a lot about safety in the surf zone, but the dilemma described above is incomplete. There is a third alternative; it’s the wait it out solution. I can tell you from experience, those waiting hours pass ever so slowly. I mentioned earlier that my wait to see H. crassicornis was years-long. It started during my freshman zoology class. One of our texts was Between Pacific Tides. 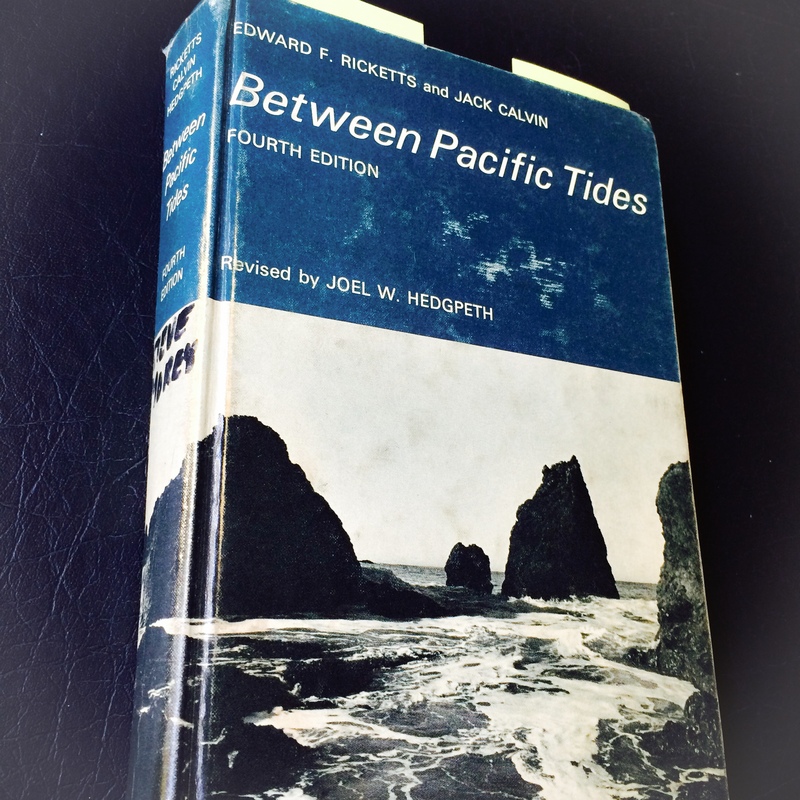 I purchased my Fourth Edition in February, 1974 for $8.25 and poured over its pages in preparation for our field trip to the tide pools at Pacific Grove, California. Long before our field trip the scientific name and an image of H. crassicornis, straight from the color plates in Between Pacific Tides, were captured forever in my mind. We didn’t even look for nudibranchs. 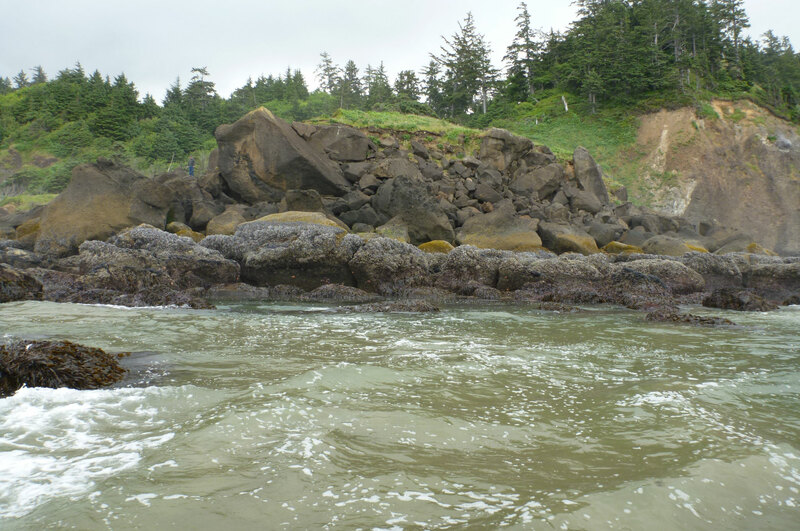 That was my only trip to the Great Tide Pool and, as advisable as it may be, until recently I rarely gazed into tide pools. 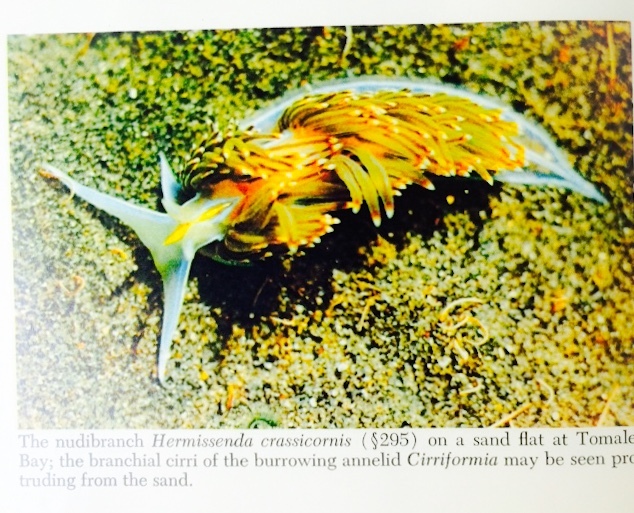 Talk about coming full circle, forty years elapsed between my discovery of Hermissenda crassicornis on this color plate in Between Pacific Tides and my real life discovery of it on the Oregon coast. 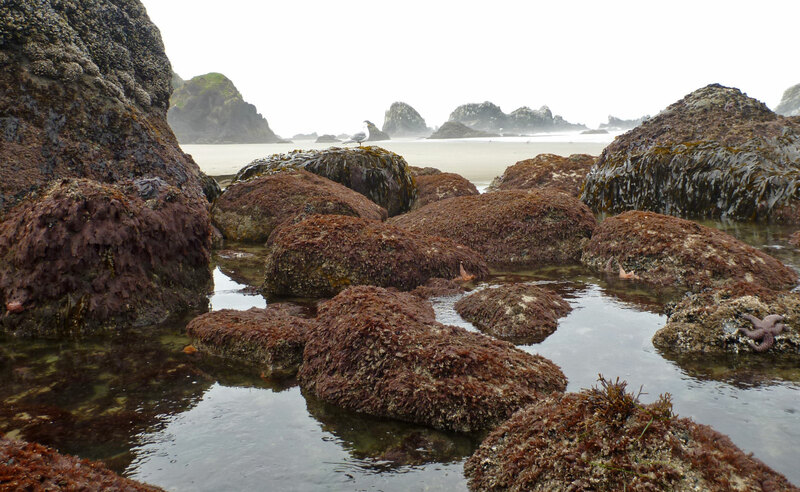 I’ve been up and down the Oregon coast and I’ve never seen a tide pool like that. Could you please direct me, either in an email or here, as to where it is? I would love to investigate it. Sure, no problem, just shoot me an email. You should see it at the top of my homepage.